Welcome to this weeks edition of Five Star Frou-Frou. Valentines Day brought some beautiful links and I thank you all. I had a terrible time choosing features this week, so that can only be a good thing, right? The standard of everyones' posts was absolutely fabulous. In the end, how could I go past Rita from Panopoly's recounting of her Fathers love letters to her Mother during the war. Heartwarming doesn't begin to describe this post. I defy you not to cry. Please click on the image above to take you there. Leigh at A Chat over Coffee also brought tears to my eyes with her tutorial on silk corsages that she distributes to the widows and widowers in her church congregation on Valentines Day. Just beautiful. 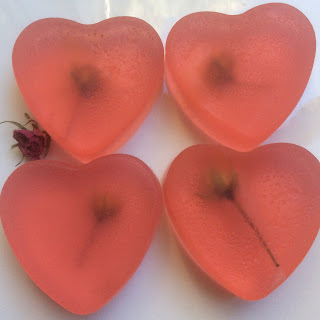 And finally, Annabel's beautiful pink, heart shaped soaps, embedded with rosebuds, were perfect for Valentines gift giving. You have to see what else Annabel got up to as well. Stunning! Thankyou again to everyone for linking up. I honestly would have loved to give everyone a feature this week! Thanks for another wonderful party. Love the features. Thank you for the party, have a great day!! Thanks for hosting the fun party and enjoy your weekend Mimi! Mimi, thank you for hosting us and for featuring my love letter post. It warms my heart so! I am new to your blog and party. i found you through another blog. I am now following you in all the places that you listed and have added you to my Blog Roll and weekly party list! Looking forward to partying with you each week! Thanks for hosting, Mimi! I wish you have a wonderful weekend! Thank you, Mimi, for featuring the corsages. It's an honor to be included among such lovely posts. Thank you Mimi! I had two weeks soap making and loved it! Added enormously to my gift cupboard and supplies. Such great features, Mimi! Have a beautiful weekend! Thank you Mimi for Five Star Frou-Frou 37, a pleasure to visit and join in. Have a lovely week. Couldn't agree more about featuring Rita's dad's love letters. What a treasure for their family! Thanks for hosting. Sorry to be late linking up. I've been out of town. You did a great job of choosing the links. The love letters are so heart warming. I too, apologize for the late link up and I'm happy to be here. Have a lovely week!